Or, rather, I de-nailed it. If you’ll recall from a few posts back, I’d recently (it’s a relative term) picked up the heart pine beams I was going to use for my new workbench. Most of them were in fairly good shape, except one that still had a few nails buried in it – five, to be precise. After spending some time sorting beams, flipping and flopping them around to determine the best layout for the top, I had them lined up the way I wanted. I struck a few lines with a square and straight edge and trimmed them to length with a hand saw. Because the beam with the nails still in it was a few feet longer than the others, I used this step to remove two of the nails for me. That left me with three nails to pull, since I did not want to bury them in the top. Having de-nailed several hundred board feet of reclaimed white oak (which was all clench-nailed when the wood was still green), I know how hard it can be. It isn’t something that causes me to skip to the shop with excitement, to be sure. 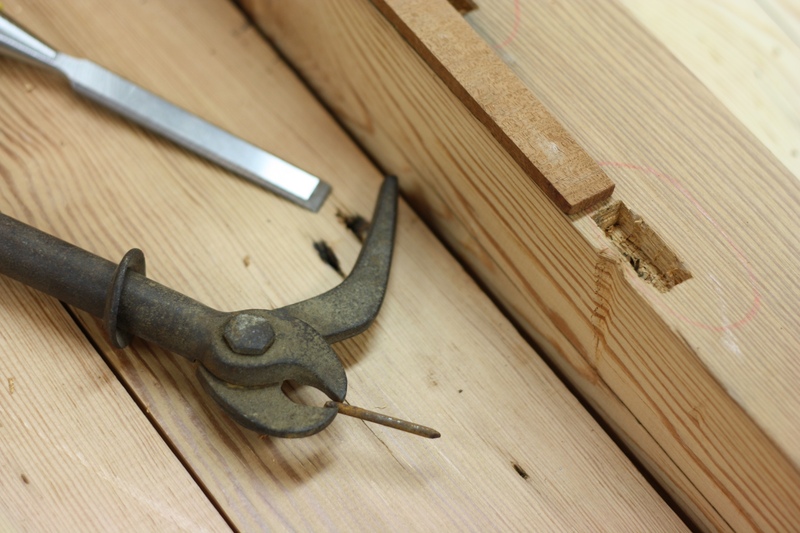 But, in this case, I saw an opportunity to use a tool I’d picked up at an estate sale about six years ago and had not yet had the chance to use – an old Keen Kutter nail puller! 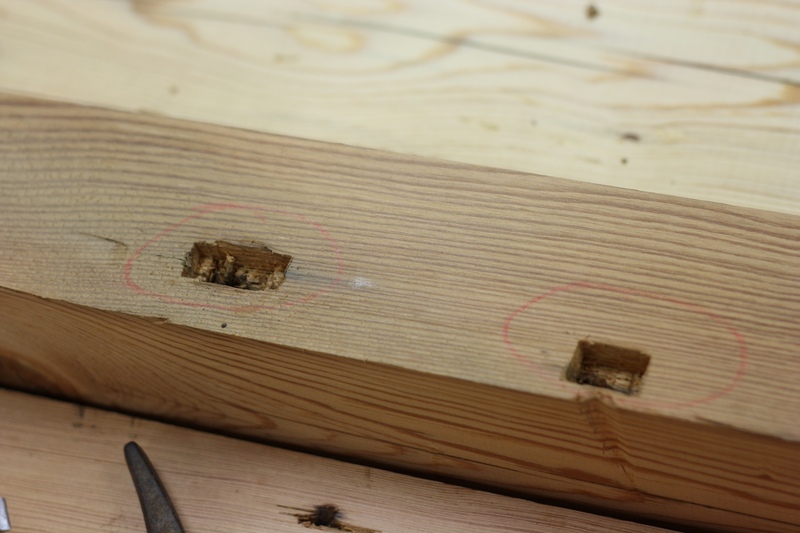 Since all three nails were broken off below the surface, I had to excavate a bit of wood from around the holes to make room for the jaws of the tool. 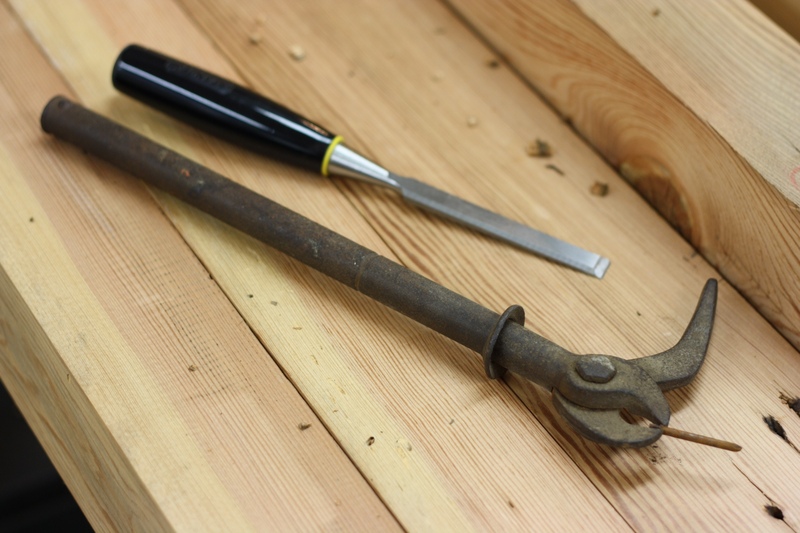 Now, some people might say, “To begin, reach for an old chisel…” I say they’re wrong! All of my old chisels are my BEST chisels. I’ve spent a lot of time rehabbing them into good condition, so why on Earth would I use them to chop into wood around old rusted nails? No, this is when I reach for a NEW chisel – one of the chisels I bought when I first got into woodworking and didn’t know any better – they are perfect for such a task (and the only reason I still keep them around)! Enlarged mortise and dent on the left; initial mortise on the right. After a few minutes of work, even being careful, my chisel edge was chipped in several places. It is easy enough to grind the chips out, but it feels better not needlessly grinding a good chisel, you know? 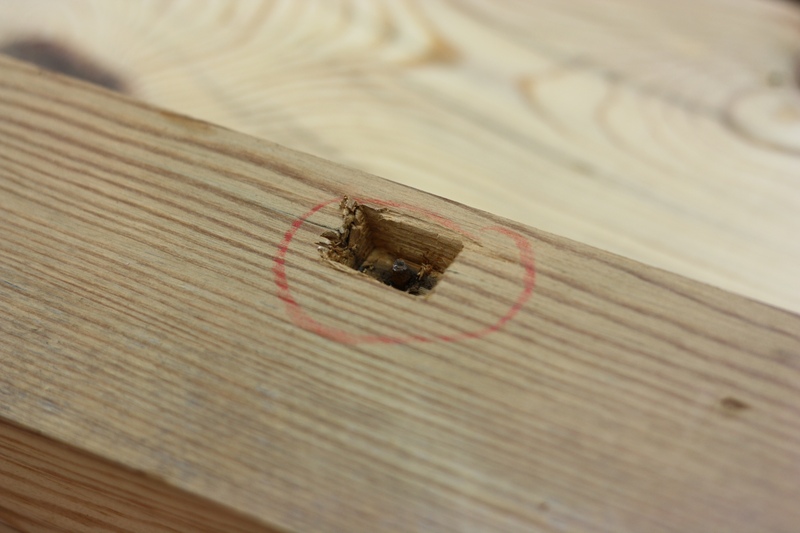 With a rough mortise chopped around the nail, things become clearer. For one thing, I clearly needed to make larger openings if I was going to get the jaws around the nails. I was done. Well… aside from patching the holes. That shouldn’t take too long, though I’ll still try to write something up if just to show you how easy it is. I know, I know, kind of an anticlimactic story. Sorry. I guess I just wanted to reiterate the idea of using the right tool for the job. Or, part of the right tool, anyway. 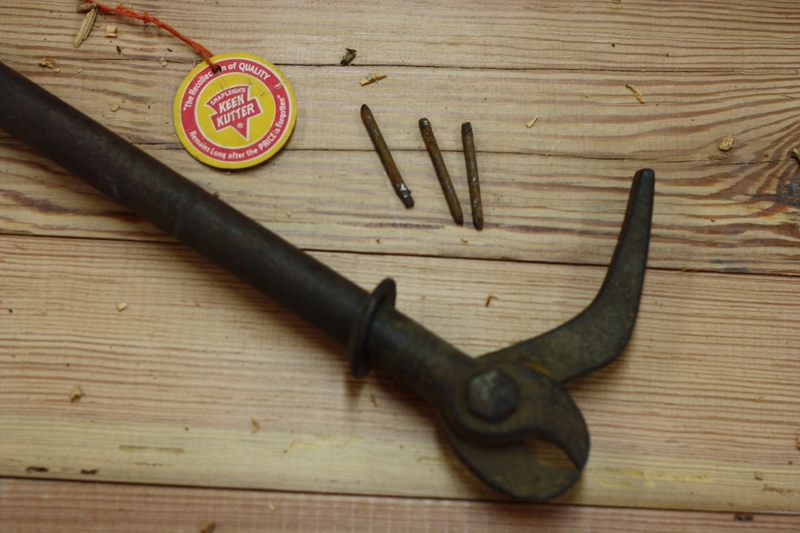 Looking at some on-line pictures, it appears I just have the bottom half of the Keen Kutter nail puller (and the label), but… it still works just fine. And it only cost me $3, so I’m cool with that. If I ever need the extra leverage, I can probably find a piece of iron pipe to slide over the handle. The next step is to do some jointing so I can glue the top up. Although the faces were all machine-planed, I still have a lot of work to do. I’ve jointed plenty of edges before, but they were always ½” thick and less than two feet long (ahhh, the challenges of being a box-building woodworker). Having never jointed 3” thick 7’ long beams before, I expect it will take a little practice before I get the results I want. But we’re getting there. Sometimes I feel like I’ve built my workshop in the Shire, because work seems to happen so slowly there, if it happens at all. But when your shop time is limited to a few hours on the weekends, things like a sick child, warm weather better suited for outdoor work, or a visit to the grandparents can reduce those few hours to nothing. As a result, this bench build is going a lot slower than those I read about in other blogs. I hope you’re cool with that, because I am. It is what it is; when you come to terms with that sort of thing, you quickly learn to enjoy and appreciate the limited shop time you have. That’s some nice-looking lumber you have there. I sympathize on the pace of progress and the lack of shop time. Personally, I’m waiting for our Missouri weather to stay warm enough for glue to cure, since my shop is not climate-controlled. Thanks, Alex! Saturday in the STL area was just dreeeeeeamy! Before the little one’s nap time (i.e. my shop time), we were out in the back yard splitting kindling. He helped me pick straight-grained firewood and knock on the hatchet with an old wooden mallet after I’d set it in place. Helped wear him down for a nice long nap. Riving a bunch of kindling also ended up being good practice for me in working WITH the wood instead of against it. Really, not a bad exercise. Something every woodworker with a wood burning fireplace should consider doing. Ed. STOP!!!! Sam is no longer (poorly) writing this comment. Sam thinks I’m an idiot, maybe, and that I’ll post every comment to my blog because I’m so giddy about people commenting on the words that I write. Sam believes I really think the person who made this comment is real. I’m not and I don’t. So Sam’s e-mail has been made null. Sam’s URL has been modified. I will not be a part of the cancer that is Ted’s Woodworking plans. I won’t perpetuate it. I encourage and urge you to do the same. Do not purchase Ted’s bundle of fraud. Do not purchase ANY similarly large bundle of woodworking plans, almost all of which you can get for free BY THE ACTUAL OWNER OF THE PLAN on-line with just a little bit of searching. Read it. Educate yourself. Don’t believe Ted’s hype. Don’t perpetuate the scam. This is the only fake comment like this I’m going to let through; I won’t waste any more of my time or your time with it in the future. But I wanted to have my say regarding this topic at least this one time. When your Grandpa Koehne used to build things he took paper palettes (sp.) apart–the kind huge rolls of paper were delivered to Block Advertising, the approx name of where he worked as a layout n design commercial artist. Then he removed the nails, planed the boards, and what either he or I started calling “glued n screwed” them until they were large enough for the door or cabinet side or whatever the project was. Did I mention the wood used for the palettes was maple from New England. Not Birdseye but certainly rock hard. After he had his heart attacks n huge stroke at 54, and then a measure of recovery, he made the maple countertop for our old farm house kitchen with the same free raw materials. It fit within 1/16 ” and had to be pushed down between sink and vertical cabinet. His grandfather n uncles were carpenters in Alton IL where they built the Victorian houses with all that brick-a-brac n turnings n moldings, I presume without electric to run motors. And of course your brother Noah makes stuff like that and radial arches et al for big houses n businesses for a living. And Justin does his own brand of woodworking.